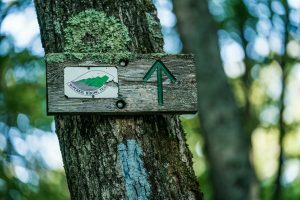 The Superior 100 Mile Trail Race was founded in 1991 and is one of ten original 100 mile trail races in the United States – currently there are about 150 held each year in the US alone. The Superior Fall Trail Race is held annually the weekend after Labor Day with the event routinely hosting runners from 35 states and 5 countries or more on a typical year. Due to high demand and a limited field, race entry is held via lottery early in the year. The race is held on the Superior Hiking Trail also known as the SHT. The SHT is a world class 310-mile long distance single-track hiking trail in Northeastern Minnesota that follows the ridgeline overlooking Lake Superior for most of its length. Lake Superior is the largest freshwater lake in the world, its power and magnitude undeniable. The Superior Hiking Trail is funded and supported by over 5000 individual members and countless volunteers along with corporate donors / sponsors and through various grants. 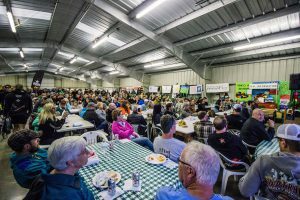 The Superior Trail Race is proud to make a large annual donation to the trail association and works diligently to drive membership and volunteerism. The trail itself travels through forests of birch, aspen, pine, fir, and cedar. Runners enjoy views of boreal forests, the Sawtooth Mountains, babbling brooks, rushing waterfalls, and abundant wildlife. The lowest point on the trail is 602 feet above sea level and the highest point is 1,829 feet above sea level. Race weekend is comprised of three point-to-point races all ending in Lutsen, MN including the following race distances; 100 (103.3) miles with 42,000FT of elevation change starting at Gooseberry Falls State Park on Friday, 50 (52.1) miles with 25,000FT of elevation change starting near the town of Finland on Saturday and the traditional marathon distance race of 26.2 miles with 11,000FT of elevation change starting near the town of Schroder on Saturday. All three races boast nearly 100% single-track courses, a sawtooth profile of relentless ups and downs (usually sans switchbacks) resulting in those huge elevation gain and loss stats along with technical trails littered with roots and rocks. These factors all contribute to each race standing on its own as some of the toughest races of their respective distances in the entire country. The pre-race meeting, held in the 4H building at the Lake County Fairgrounds, was a flurry of activity. The field of 100 mile runners, and their families, gathered once again for the start of an amazing weekend. Before the three days would come to a close, dreams would be realized, goals achieved, and (unfortunately) hearts broken. Thursday night is about celebration, camaraderie, and preparation. Once again this year, the incredible Ian Corless was in attendance to take beautiful portraits of all the runners. 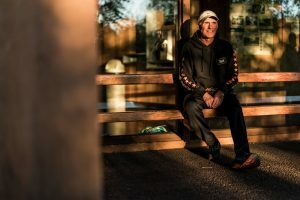 Local writer, and author of “Superior – 100 Mile Endurance Run, One of America’s Oldest, Toughest, and Gnarliest Ultramarathons”, Kevin Langton, was on hand to sign copies of his book, while he too waited for the starting gun. It’s always wonderful to have these running celebrities at our events, but the real heroes are the amazing runners that come back year after year to experience all that Superior has to offer. This year there were three incredible achievements on the line. The one-of-a-kind Stuart Johnson was set to achieve his 20th Superior 100 finish. Many runners have a hard time contemplating a single repeat of the Superior 100, let alone 20 finishes. At the same time, we also honored two phenomenal individuals who were attempting their 100th, 100 mile race. Susan Donnelly and John Taylor decided that the only place for this accomplishment was at Superior. While there are no official records kept, it is believed that there are less than 10 people anywhere that have achieved this feat. From there it was time for all of the usual announcements and instructions that come with a race of this size. New to 2017 was a much feared river crossing. The Split Rock River bridge is currently out, and the only way to get across is straight ahead through the water. Race Director John Storkamp had yet another surprise for the runners. Just a bit further up the course some industrious beavers (assuredly residents of the town Beaver Bay), had decided to construct a dam. This meant that another section of the course was doused in knee-high water. For a point of clarification, John made sure that everyone knew that knee high was on a 6 foot man. As the evening wrapped up, there were the traditional call-outs, asking who had run Superior before, and who was on their first 100 attempt. Every runner who attempts this course is special, and everyone deserves recognition. It doesn’t matter if it’s your first attempt, or your fifteenth, Superior runners are a special breed. The final tribute of the evening was to those who are no longer with us. 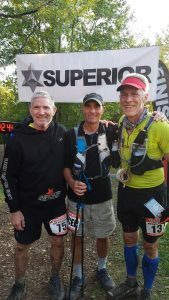 In particular, our trail friend John Mathson, who passed away while running the Spring Superior 25K earlier this year. The trail community has come together to help support his wife and family with a tremendous outpouring of financial and moral support. Soon the evening came to an end. People were fed and happy. Friends were reunited, and new friendships developed. Drop bags were loaded on to trucks to await their owners out on the trail. It was time for the runners to depart for one last night of fitful sleep. Two words permeated every conversation over the course of the Superior 100 race… “perfect weather.” With high temps in the low 60s and lows in the upper 30s, it was a runner’s dream. The days were filled with cloudless skies, and the nights were crisp and beautiful. For a spectator, it meant pulling out jackets and gloves, but for the runners it was heaven. The cool temps helped drive an incredible race this year. Right from the start, Voyageur 50 winner Neal Collick decided to put his mark on this race, and his first 100 mile attempt. Coached by Superior 100 course record holder Jake Hegge, Neal showed the field exactly how it’s done. Neal took advantage of a solid sprint on the opening bike path portion of the course to establish dominance. He arrived at the first aid station 6 minutes ahead Matias Saari, and that lead continued to grow. By the halfway mark his lead was 47 minutes and growing with every aid station check-in. The long dark night did not seem to slow Neal down, and by the time he finished at 3:31am he had a 2 hour and 41 minute lead on the closest competitor. As Neal approached the final stretch of the race, Jake Hegge, met him to try and push him just a little bit harder; the course record on the line. As Neal crossed the finish line in 19:31:40, his dominance of this course was apparent. However, a mere 65 seconds separated him from claiming the title of course record, which for the time being will remain with his coach. The race for the other podium spots on the men’s side was not a foregone conclusion. Alaskan, Matias Saari looked strong throughout the first half of the race, but had to drop after mile 72. The experience of the Minnesota runners showed itself in second and third place. Eventual second place finisher Paul Shol started conservatively, hitting the first aid station in 50th place, but then picked up speed through the evening and dominated the rest of the pack to establish himself as the second one to beat. Similarly, Adam Schwartz-Lowe showed his raw talent through the overnight hours, recovering from 7th place all the way to 3rd; hunting his prey in the dark like a vicious trail beast. On the ladies side, Gretchen Metsa blew away the competition with a course time of 25:23:03. Gretchen established her lead early, picking off Kristy McBride by the second aid station. She then ran a strong race throughout the evening, extending her lead to nearly 3 full hours over second place finisher Tina Johnson. 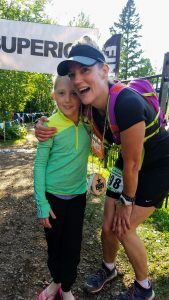 Tina (this year’s Zumbro 100 ladies champion) seemed to struggle in the early portion of the race, but eventually showed the depth of her ultrarunning experience by pulling up strong through the cool night for a great second place finish. The final podium spot was reserved for a second time for Stephanie Hoff who ran a smart and patient race, slowly picking off the competition with her endurance and experience. Runner after runner commented on how helpful the cooler temps were to a solid race this year. Hundred milers were able to keep cool and hydrated easier than in years past, which meant that they could move faster and easier through the terrain. Although they were hampered by a muddy course, most runners loved the trade off. We don’t always get the weather we want at Superior, but when we do, it’s a thing of beauty. The 50 mile race is the smallest field of the three events over the weekend. Tight cut-off times combine with the reality that many runners will start in darkness, and finish in darkness as well. However, the smaller field size does not diminish from the amazing talent that was on display this year. 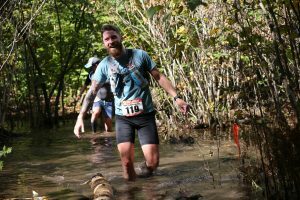 Despite missing the water crossings, the 50 milers still had to contend with very muddy trail conditions. Despite this, Brent Loberg was able to come within 5 minutes of breaking the course record and scoring his first Superior 50 win. Brent was on the podium last year in the number 2 spot, and came back with a vengeance, improving his time close to 45 minutes. His final time of 8:42:53 was (almost to the second) exactly 30 minutes ahead of Forrest Tracy who nabbed the second podium spot. The final men’s spot was filled by Marc Malinoski, skirting the 10 hour mark, and completing an all Minnesota podium. On the ladies side Kelly Teelselink brought home the win from Iowa City with a time of 10:47:22, and an overall 9th place finish. The race for second was a bit closer with Rochelle Wirth just edging out up-and-comer Anna Yurchenko. Despite no records being broken, the ladies showed that there’s a lot of competition in the field. Erika Lohn missed the podium by a mere 14 seconds behind Anna, demonstrating that her past podium finishes are no fluke. As the night wore on, the field of 50 mile runners continued to stream to the finish line. Being intermixed with the big ticket 100 mile runners, and the excited (and fresh) marathoners, can be tough. However, the crowd was always there to welcome them with open arms. 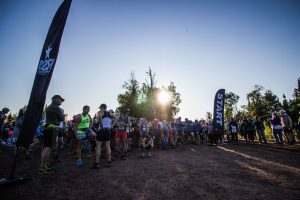 Achieving 50 miles on Superior is no joke, and many years there are a number of people who can’t make the cutoffs at the final aid stations. This year those cutoffs were slightly extended and it helped give people a fighting chance to exorcise the demons of years past. Saturday morning brought out the fresh faces of the 2017 Moose Mountain Marathon. 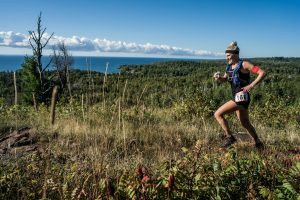 This race is the “fun run” of the weekend, with 26 miles of beautiful Superior Hiking Trail, including three of the most brutal climbs of the course. Although the weather was a welcome change, it didn’t make as much of a difference on a shorter distance race. The muddy course slowed down runners enough to keep the course records safe for another year. Off the heels of running CCC over in Europe, Michael Borst decided early on that he was going to make the Marathon a race for second. From the opening gun he established a lead that eventually grew to almost 13 minutes. 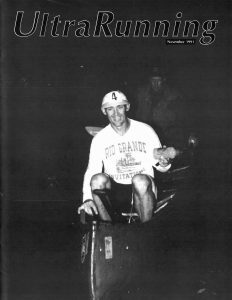 At no point was he not in control of winning, which he did with a time of 3:36:36. The rest of the podium brought it back to Minnesota with James Sorensen and Kurt Keiser taking 2nd and 3rd respectively. Even fourth place finisher Rob Henderson shredded the course with a blistering sub-9 minute pace. This is no small feat on a trail that requires climbing up Carlton Peak, Moose Mountain, and Mystery Mountain; one right after the other in relentless torment. Emma Spoon once again demonstrated why she is a queen of this distance, burying her competition with a nearly 40 minute lead, and a new course record. Emma is intimately familiar with Moose and Mystery Mountain, having placed in the top three in four different Spring Superior 25K appearances. That knowledge helped her establish an impressive 7th place finish in the overall standings with a time of 4:08:30. Ashley Hanson and Stephanie Sathre battled each other for second and third place, with only 3 minutes separating them by the finish. Despite being billed as the “easier” race, Moose Mountain Marathon is no joke. It requires dedication to overcoming the relentless hills, roots, and rocks that are thrown at you over the course of 26 miles. The marathon also boasts some of the most impressive scenery of the course, with spectacular overlooks on top of Carlton Peak and Moose Mountain itself. The overlook on top of Moose Mountain is worth a short pause to soak in all the reasons we do this crazy sport. As darkness fell on the course for a second time, the awards ceremony commenced. One of the most beautiful displays of community is the continual cheering of runners who are coming in after dark. The award distribution pauses every time a headlamp shows up on the trail. Every runner at Superior is special, and everyone deserves all the accolades they can get. However, when amazing people do truly amazing things, it’s important to recognize it. 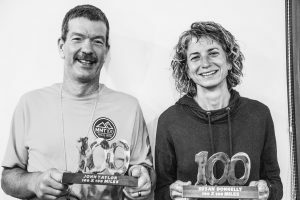 Before the evening ended, Susan Donnelly and John Taylor had completed their 100th 100 mile finishes, commemorated with a beautiful award. Stuart Johnson crossed the line shortly before the cut-off cementing his place in Superior history with his 20th completion. Recognizing the amazing talent of our community is inspiring. Witnessing the determination of Brian Landstrom and Jeff Goldstein, two of the O.G.’s (“old guys” or “originals”), or the passion of Hadley Knight, the youngest marathon runner (9 years old) to ever finish a Fall Superior Race, makes all of us realize that we can all be a part of this. We may not be the fastest, or go the longest distance, but we show our love and passion for the community and the trails that we love with every race we attempt. The beauty and power of being out in nature, experiencing things that no one else will experience in the same way, is intoxicating. It’s why we keep coming back, year after year. Runners, volunteers, family; they all return every fall to the north shore to join in our trail family reunion. There are no political differences out on the trail. There are no religious differences on the trail. It is simply people, doing amazing things, whether running or working. Trail people, who want to experience life to the fullest, find inspiration, comfort, and encouragement in a wonderful community that is truly Superior.